While Brooklands was operational in the UK, motorsport in Europe was also flourishing. The French oval circuit of Montlhéry was home to many drivers, male and female, and women were not excluded from the road-racing scene which centred around Italy. Its most famous events, the Targa Florio and Mille Miglia, were never closed to them, and drivers of the calibre of Elisabeth Junek were among the front-runners. As well as these high-profile events, other circuits hosted a whole series of races. Many of the drivers also raced at Le Mans; there were far more female entries then than there are now. Below are short profiles of some European female racers, who mostly competed in the period between the two World Wars. Maria Antonietta d'Avanzo, Margot Einsiedel, Madame Hellé-Nice, Lucy O'Reilly Schell, Jannine Jennky, Anne-Cecile Rose-Itier, Charlotte Versigny, Marie-Luise Kozmian, Lia Comirato Dumas, Marguerite Mareuse and Odette Siko have their own posts. Rally drivers from this period appear in their own posts (1, 2). Lists of female participants in the Targa Florio and Mille Miglia are also available. American drivers of the early 20th century can be found here. French drivers of the period also appear here. Mimi Aylmer - competed twice in the Mille Miglia, in 1929 and 1936. She drove a Lancia Lambda Berlina to 29th place in 1929, with A. Strignasacchi. In 1936, she and Gambellini drove a Fiat 508 Balilla Gas, but did not finish. Mimi was better known as a film actress. “Miss Comerford” – early Irish driver. She drove in the 1933 Phoenix Park 50 mile race in Dublin, and is claimed to be the first woman from the British Isles to enter a road race. Her car was a Hillman Minx, and she was ninth in the Senior Race. During the same season, she won the 1100cc class in the De Selby hillclimb, and was second in the Unlimited class. Her given name is never used, and even her initials are unclear. She does not seem to have raced again after 1933. Giuseppina Conti - drove a Bugatti T37 in races in 1927. She was eighth in the Circuito del Pozzo that year. Marie Cousinet - raced a Fiat 509 in European cyclecar events in 1928. She was fifth in that year's GP des Frontieres. Marie Depret (Desprez) - raced in French GPs and at Le Mans during the late 1920s and 1930s. She and Pierre Brussienne shared a Bugatti T34 at Le Mans in 1933. Previously, she had raced against Jannine Jennky in France. Viviane Elder - French competitor who drove at the Le Mans 24 Hours in 1949, sharing a Simca 6 with Rene Camerano. They retired on lap 95 when the crankshaft broke. In 1950, she was due to return to the 24 Hours in a Simca 1100, but did not make the start. Away from motorsport, Viviane was a film actress and aviatrix in the 1930s. She may have driven in the celebrity races which were popular in pre-war France. Edith Frisch - raced and rallied a Bugatti and other cars in Europe, in 1933 and 1934. In May of 1933, she was sixth (although not classified) in the Eifelrennen Voiturette race at the Nürburgring, driving a 1500cc Bugatti T37A. Later that year, she entered the Czech Grand Prix at Masaryk, in the same car. She had to retire after spinning the car, and hitting her chin on the steering wheel. In 1934, she drove an Opel, concentrating on rallies and other non-circuit events. She won a Coupe des Alpes in the Alpine Rally, with Karl Treber as her navigator. Unfortunately, not long afterwards, she was killed in an accident at a level crossing during a reliability trial at Hammereisenbach, in Germany. Bea Gilka-Bötzow - raced a Bugatti in Europe in the early 1930s. In 1932, she entered the Eifel Grand Prix in a T37A, but did not finish. She also competed in hillclimbs in Germany and its neighbouring countries, in the Bugatti and in an Austro-Daimler. Her results are not forthcoming. She is sometimes confused with Margot Einsiedel, as both had the title “Countess Einsiedel”. Bea was Margot’s sister-in-law. Suzanne Largeot - took part in three Le Mans races between 1937 and 1939. With JE Vernet, she won her class in 1937 and was twelfth overall. She did not finish on the other two occasions. The car was a Simca, a make Suzanne used in most of her races. In 1939, she drove a Simca T8 to fourth overall in the Criterium Paris-Nice. That year, she also navigated Yvonne Simon to eighth position in the Monte Carlo Rally. She and Yvonne were also eighth in the 1938 Paris 12 Hours. Nina Lo Bue - competed with her brother, Vincenzo Lo Bue, in 1929 and 1930. In 1929, she drove an Alfa Romeo in the Giro d’Italia and finished thirteenth. The following year, the siblings entered the Giro d’Italia once more in the same car, and were fourteenth. It is possible that she also took part in some hillclimbs in Sicily, as Vincenzo regularly used the car for this purpose. Franziska Lüning - raced a Steyr in Europe in the 1920s. She competed in the ADAC trials in 1928. On occasion, she also drove a small Fiat sportscar. It was this car that she used in the 1927 Nürburgring Opening Races. She was twelfth in her class. That year, she also drove the Steyr in the Feldbergrennen hillclimb and placed well in class. She took part in hillclimbs in Switzerland as well. Driving the Fiat, she was second in the 1100cc class in the Klausen climb. This was her second attempt at the event, having finished 13th in the 1500cc class in 1926. Irma Martelli - raced in Italy shortly after the Second World War. In 1947, she drove a Fiat in the Mille Miglia with “Geri”. They did not finish. A month later, she entered a Fiat 500, perhaps the same car, into the Coppa d’Oro della Dolomiti, but did not finish that race either. Violette Morris - raced in France between 1928 and 1930, normally in Paris-based events. She drove a number of special-bodied cars, built to her own requirements. The Bol d'Or was a favoured event of hers and she won it in 1927. She was executed during World War II due to her Gestapo activities. Vittoria Orsini - Italian noblewoman who campaigned a Maserati 26C in a few Grands Prix in the early 1930s. Her best result was probably a fourth place at the Circuit Cap d'Antibes in 1932. She was tenth in a heat of the 1933 Bordino Grand Prix, but did not finish the 1932 or 1933 Coppa Ciano, or the 1933 Grand Prix of Lwow. Mirella Quadri - entered the Mille Miglia three times, in 1947, 1948 and 1949. In 1947, she drove a Fiat and did not finish. The following year, she used a Lancia Aprilia and was 20th. In 1949, she drove a Lancia, presumably the Aprilia, and failed to finish. Her co-driver on all three occasions was “L Quadri”. Käthe Rantzau - Austrian driver who raced in Europe in the 1920s. She was fourth in the 2000cc class in the 1925 Klausen hillclimb, driving an Ansaldo. Later, in 1927, she entered the Semmering climb in a Grofri, which was a rebadged Austrian Amilcar. . Her first motorsport experience seems to have been a tenth place in a women-only road race held in Vienna in 1923. She was tenth, driving an Austro Daimler. She is best known as an opera singer. Anni Roosdorp - commenced racing in 1947, using a Veritas single-seater at the Grenzlandsring in Germany. 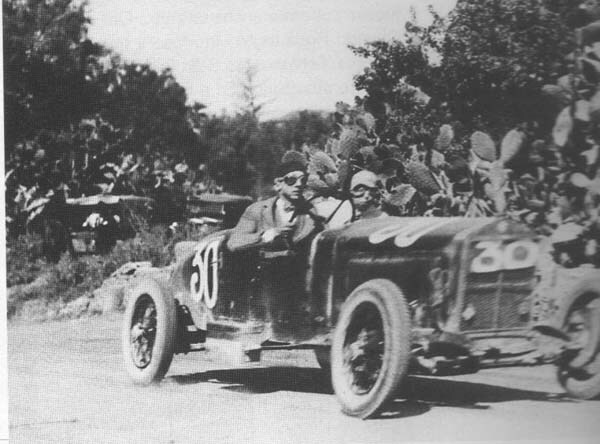 Her father, Hermann Roosdorp, also raced that car and others around Europe. Fernande Roux - another French GP and sportscar racer of the 1930s and 1940s. In 1931, she spent a season campaigning in Voiturettes, in a Bugatti T37A. Her best finish was second, in Geneva. She partnered Germaine Rouault at Le Mans in 1938, driving an Amilcar Pegase. The Pegase seems to have been one of her favourite cars and she drove it in French and North African races in the latter part of the 1930s. Elena Samsonova - early Russian driver, born in 1890 and active shortly before the First World War. In 1913, she was tenth in an off-road trial near Moscow, driving an American Hupmobile. In 1914, she drove the Hupmobile in another trial, on roads this time, near St. Petersburg (Volkhonskoe Road). She set a time, but her position is not recorded. Shortly before this, she had raced in the Grand Prix de l’Automobile Club de St. Petersburg, in the same car. Her race ended on the third lap, due to a damaged wheel. She had been sixth. Later, she qualified as a pilot, and became one of Russia’s first active military pilots, mostly in reconnaissance. She died in 1958. It’s so great that women have been a prominent part of car race history for a very long time. I’d love to go back in time to watch the best of them driving some amazing vintage automobiles! The racing gear these women wore is also very fascinating. Hopefully, it was enough to protect them from injuries. The Andros Trophée Féminin - "Ice Girls"